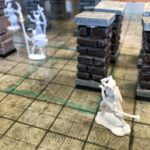 Years ago now, when I first started trying to explain my Role Playing Group to my wife, it was clear that she didn’t see what I saw. Didn’t see the epic battles, the intense negotiations, the realization that discretion really is the better part of valor and retreat is always an option. Rather, she imagined foam swords and bad accents. Since then I’ve imagined convincing her to take part in at least an RPG one-off night where I could show her what it was really like. 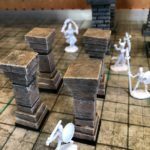 She wasn’t interested in playing with a group more experienced than her, so decided I’d have a newbie one-shot night an invite some other friends who I thought I could arm-twist in to playing with me, even for an evening. 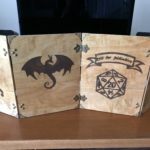 I decided it would be D&D 5e because even though I hadn’t GM’d 5e before, I felt I was familiar enough to guide a bunch of starter players through a night. I also wanted them to have enough cool things to do that it would feel epic, so I also decided their characters would be fourth level as, from my reading, it seemed as though the first couple levels might not be all that much fun for a starter players. 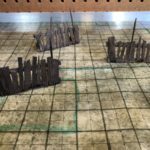 At first, I thought I’d simply download a free one-shot and play that and that’s pretty much what I did. 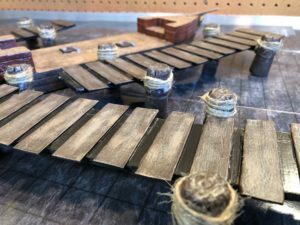 I found The Secrets of Skyhorn Lighthouse on the very cool site The DMs Guild. 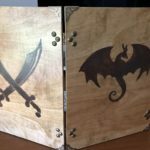 It felt about right, it was very well written and made it easy for me to run as a first-time D&D 5e module. Also, I knew I could get pre-generated characters for the players so I wouldn’t have to make them go through all the cruft of generating characters from scratch. A few emails asking what they want to be and I’d be ready to go! So, ready to roll, right? Just invite folks over and make it happen. The rational part of my brain thought I was in pretty good shape. The obsessive part of my brain said, “Oh! This’ll be fun. How about if we…” and then started bombing my brain with ideas to try and make this a special night. 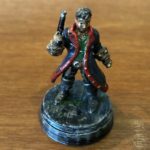 Rinin, the shifty half-elf Rogue, what is he hiding and whose pocket has he picked? Kwai Chang Caine, halfling Monk, in search of peace and tranquility, but seemingly doomed to find neither. Brain: “Nearly, but you know that cool scene near the beginning where they’re negotiating passage and they have their first fight encounter? I know you were going to just draw that out, but wouldn’t it be even cooler if there were an actual boat for them to fight on and around? And there went another week of free time, but again, the results were kind of cool. 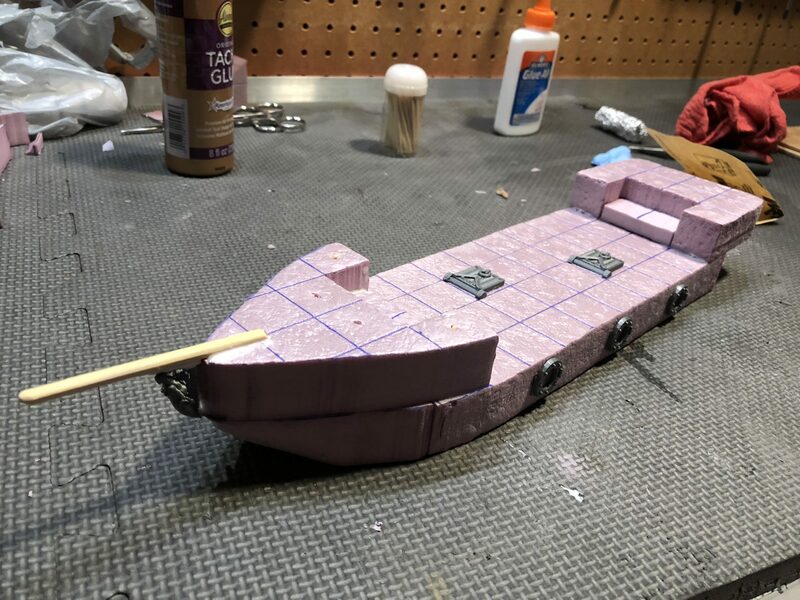 Note: The ship is constructed from XPS Foam insulation, cut, glued and carved, 3d printed elements added and then paint. So, I had to build some docks. The docks use jute twine for the ropes around the pilings and use XPS foam for the pilings, tongue depressors for the boards, paint and hot glue. So, I had to do that because clearly I’m just along for the ride at this point. 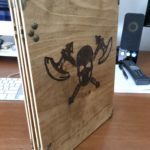 The screen is made from a sheet of 1/8″ hardwood plywood, some cool brass bits for the corners and hinges and some cool Chicago screws to hold it all together. I painted the decorations on the front after tracing them on to the wood. Then sanding gently to go for a weathered look (not entirely successful). The brass parts were “aged” using a mild acid to remove the shiny. All of this is a combination of what my dumb brain came up with and some ideas I stole from various other projects. Oh, and I used a dremel to inset small magnets on the inside of the screen so I can attach my own content on the inside or outside as needed. Finally, before application of the hardware, there were three coats of polyurethane with sanding between layers. Four pieces, two sides, three times. 24 times applying polyurethane. This went on for a while with me waaaaay overdoing it and putting far more time in to prep than I would use in that one five hour one-shot. Like 10x. Yeah, I’ve got issues. And, in the end, not only did we not get through the one-shot which I really knew wouldn’t be a one-shot, we really only got through about a quarter of it. But we did use the boat and dock. 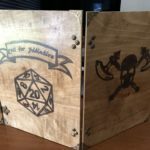 And I got to use my GM screen. I think the Party had a good time and my wife and friends got an introduction to playing role-playing games. Me: Stabs brain with sharp pencil. It’s fun for me to build dungeon stuff, even if it’s not entirely clear when I’ll use them. Yet. 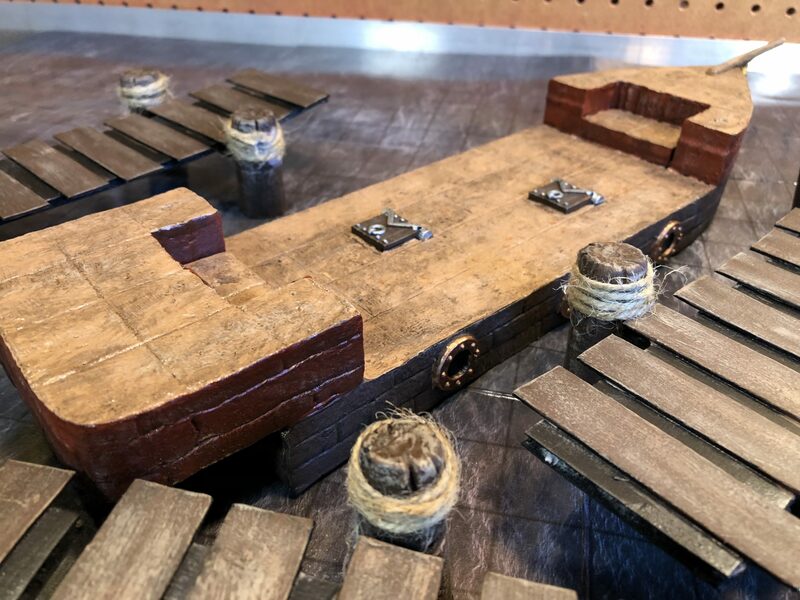 All three of these projects, the rocks, the columns and the barricades are based on projects I saw either on Black Magic Craft or Game Terrain Engineering. 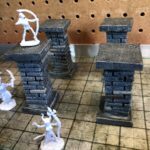 The former is a creative channel, mostly focused on creative table elements for RPG games, the latter is some of that, but he also throws in some cool uses of 3d printing. Both are enthusiastic and are clearly having fun and I get good ideas of things to try, techniques to work on or just cool projects to watch being built – which serves as fodder for my own imagination. 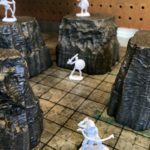 The first are some large rocks used as terrain scatter for outdoor or subterranean encounters. They are intentionally flat on top. These turned out okay, but aren’t natural enough looking. Might do again. The second are a set of columns in a couple different styles. The last are a set of barricades to throw down to impede direct progress or just for visual interest or cover. 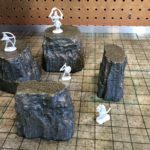 We were starting a new campaign and gaming system in our RPG group and I couldn’t find a mini I liked. 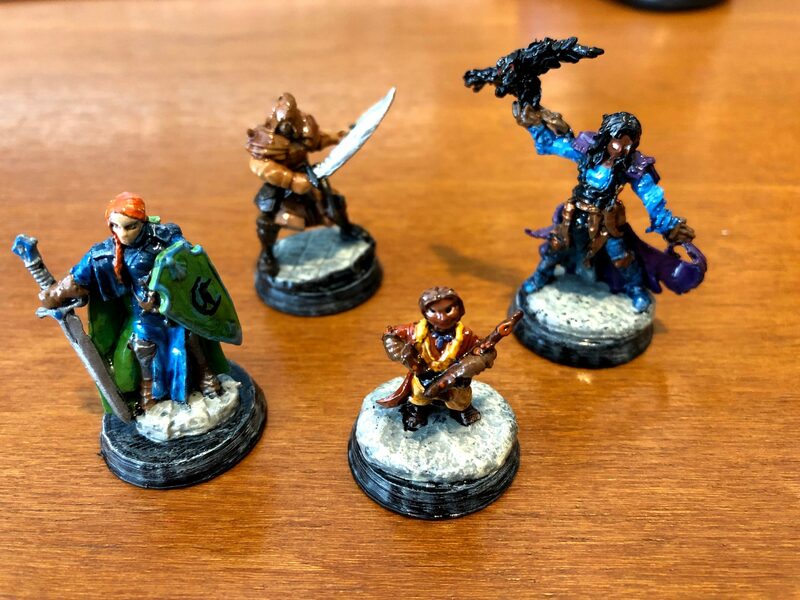 I enjoy the process of creating the backstory for my character and that means a certain look and feel to the mini would be ideal, something that matches the version in my head. 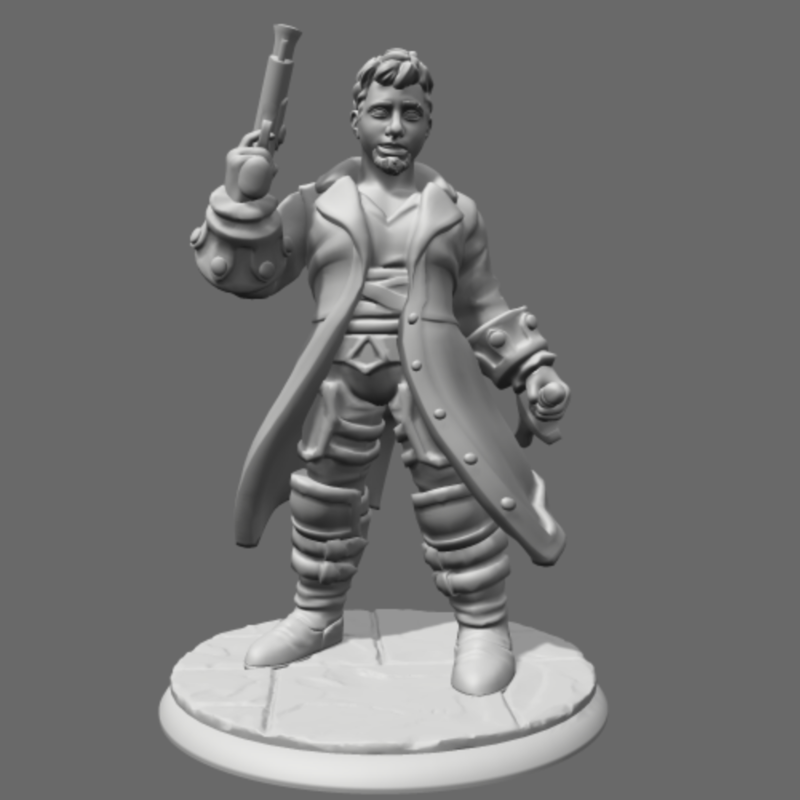 I couldn’t find anything for this guy, either between the box of Bones minis I have from their Kickstarter or online. 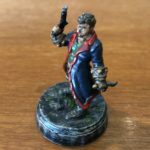 I decided it might be time to try Hero Forge an online service that allows you to create a completely unique mini and then have it 3d printed and sent to you. The user interface is all web-based and you get to build your mini on some templates for race, gender and then you can customize to your hearts content. This guy, my new character, saw himself as a self-made man, a bit cocky, certainly self-assured. A bit of a swashbuckler and trying to live above his class. His main weapons would be a pistol and an assassin’s blade. With that vision in mind, I went to town on the user interface to try and create my character. 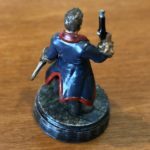 It took a couple weeks to receive the printed miniature as it gets outsourced to another service for printing but eventually I received a small and very light package containing my one-off miniature. I painted him up and the paint job is just okay. I botched the face, going a little nuts on dirtying him up and then not knowing how to clean him back up after it dried. But, on the whole, it was a close fit to my vision. 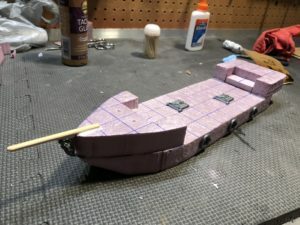 I did add my own 3d-printed base custom fit to have the other base atop it. Additionally, I have space underneath to insert/glue a washer which gives him a good heft and reduces the odds that he topples accidentally. On the whole, I was very satisfied with the experience. I got a mini that looked just like what I wanted and looked just like the 3d render that I used to create him. It’s worth noting that I would not do this regularly. The cost for the service is just too high for me to justify unless I either felt in dire need of a mini that I figured I’d use for a long period of time, maybe for a year or longer or, as was the case here, I was willing to front the additional cost for the experiment and I plan on using it for a year.